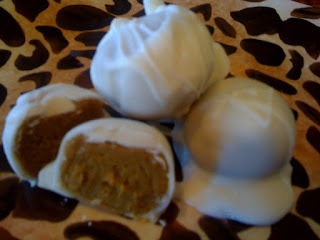 I made these using Libby's Quick and Easy Pumpkin Cupcakes recipe. I've been making the cupcakes for years. They are very moist and delicious. Click here for cupcake recipe. Basically, instead of making cupcakes, I followed the recipe and pour the batter in a 13x9 cake pan. Once the cake was done, I immediately crumbled it into a large bowl and mixed it with cream cheese frosting. I then dipped them in vanilla candy melts. You can also use Orange to give them a "harvest" look. My photo skills are good, because it makes this arrangement look GOOD! In the same vase, on the other side are roses.. remember the roses from a last week's posting? well, probably NOT the exact same ones..
this arrangement is having a total identity crisis. In a small bowl, whip the eggs with the splash of half and half or milk. In a separate bowl, mix the bread crumbs and parmesan reggiano cheese together. Salt and pepper to taste. In a skillet over medium heat, add the 3 tablespoons of olive oil. 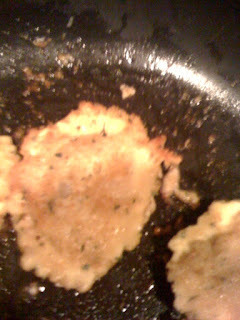 Once it is hot, dip the naked ravioli into the egg, then the breadcrumbs. Toast until golden brown, about 3-4 minutes on each side. 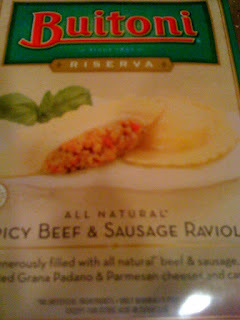 Note: I made these using ravioli stuff with spicy beef and sausage. They were good, but very rich. 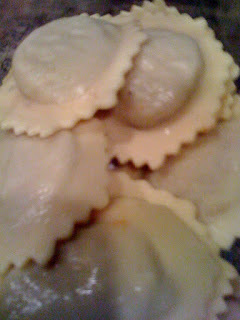 I will try again using cheese stuffed ravioli. I got the recipe from Rachael Ray, but modified it because hers included flat leaf parsley and a dipping sauce recipe. I just used what I had in the fridge, and the flavor was fabulous. I made these for the "goodie bags" for Wendy's 40th birthday party on Saturday. 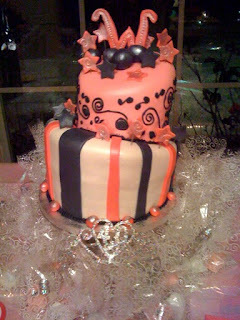 Using Betty Crocker cake mixes, I used "White" and "Triple Chocolate Fudge ". I baked them separately in 13x9 pans. Once they were done, in separate bowls, I immediately mixed the "white" cake with vanilla frosting and the "triple choc fudge" with chocolate frosting. 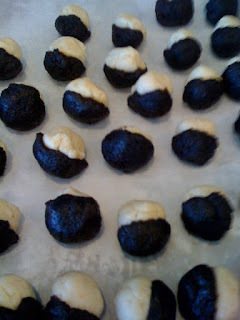 I rolled the white cake into balls first, then went back and rolled the chocolate balls and "mushed" them into the white balls creating the "black and white" cake ball. 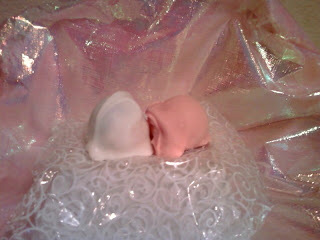 Then, I dipped them in pink vanilla melts, and when I ran out of that, I used white vanilla melts. This was pretty labor intensive (I was covered in chocolate from head to toe), so I also ended up with some all white and all chocolate cakes balls. These went into the freezer along with the remaining black & white to be "dipped" another day. 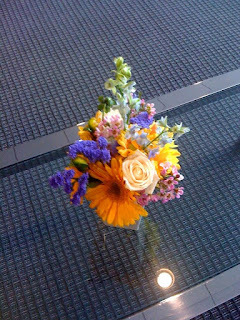 This is the latest flower arrangement in the lobby of my building. 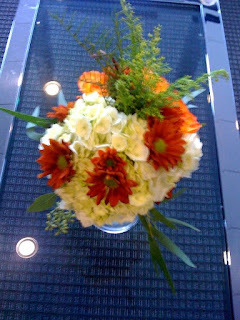 It's FALL - and is it just me, but this arrangement is very "springy"! 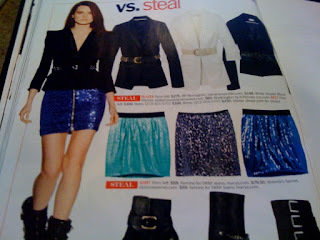 These pictures came from the November issue of a popular fashion magazine..that will go un-named since I'm not sure if I should be taking pictures and posting them! Cook pasta per the directions on the package. 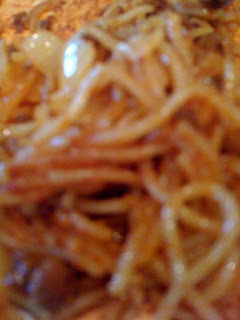 Drain the pasta, and mix in with the chili. Serve immediately. NOTE: You can use any variation of pastas and cheeses.